Rhys Chatham meets again with bassist Mago Flueck and drummer Julian Sartorius to form the Bern Project Trio. 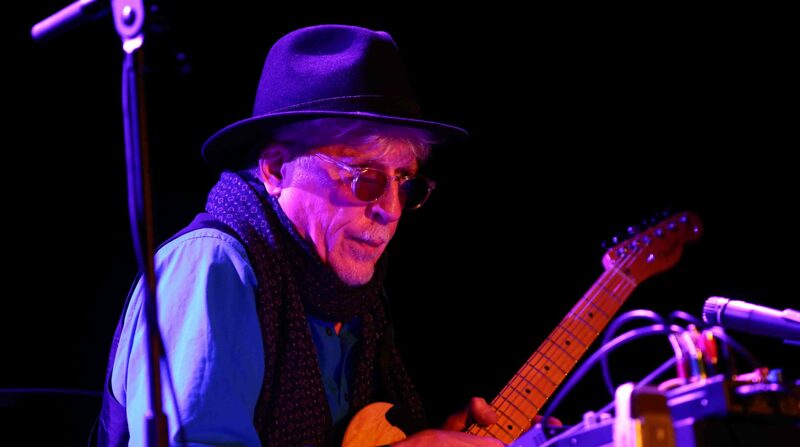 Rhys Chatham: Harmonie du soir + Guitar Trio for Guitar ArmySurprise concert! Also performed was Guitar Trio for guitar army, with the above guitarists and adding Rémi Alexandre, Nicolas Guerro and Stéphane Milochevitch. Rhys Chatham conducts a performance of his epic orchestral composition for 100 electric guitarists and 8 electric bassists. Rhys Chatham and Ryan Sawyer team up to play at the 2nd Annual Northern-Spy Music Festival.Rhys Chatham – trumpet, electric guitar. Ryan Sawyer – drums. Rhys Chatham performs a solo set on trumpet and electric guitar. Rhys Chatham (trumpet, electric guitar) with Valgeir Sigurdsson (electronics). Rhys Chatham plays G3 with local luminaries of the region of Iowa City. Legendary composer Rhys Chatham, “who toys with the expectations of amplified guitars so mirthfully in his punk-influenced orchestrations” (New York Times), is joined by the “Brooklyn psych alchemists” (Pitchfork) Oneida, whose performance at the recent All Tomorrow’s Parties festival was called “some of the best music I heard all weekend” by Ben Ratliff in the New York Times. Rhys Chatham plays trumpet and electric guitar in duo formation with drummer Will Guthrie. Copenhagen, Denmark Rhys Chatham performs solo trumpet and electric guitar as part of the Mayhem Festival, produced by Jørgen Teller in Copenhagen.